A sea of lanterns adorns the Sentosa Beach and Merlion Plazas as the self-proclaimed ‘State of Fun’ gets into the mood for CNY. There are a number of performances, including those by the Northern Lion Dance troupe and the LED Dragon Dance Troupe, which jazzes things up by introducing lights to their costumes. Dotted around the plazas are caricature artists, fortune tellers and a gigantic God of Fortune. Little ones can get up close and personal with the stars of popular cartoon Pleasant Goat and Big Big Wolf at this mall’s celebrations. They’ll make their rounds over the two weekends before CNY to play games with the kids – get a meet-and-greet pass when you spend over $50. On February 14, feng shui master Neo Zhen Jue reveals the fortunes of the zodiac signs for the coming year, and if you need to do a bit of last minute shopping, NTUC’s sale on Mondays to Wednesdays from Feburary 2 to 18 has festive goodies up for grabs. 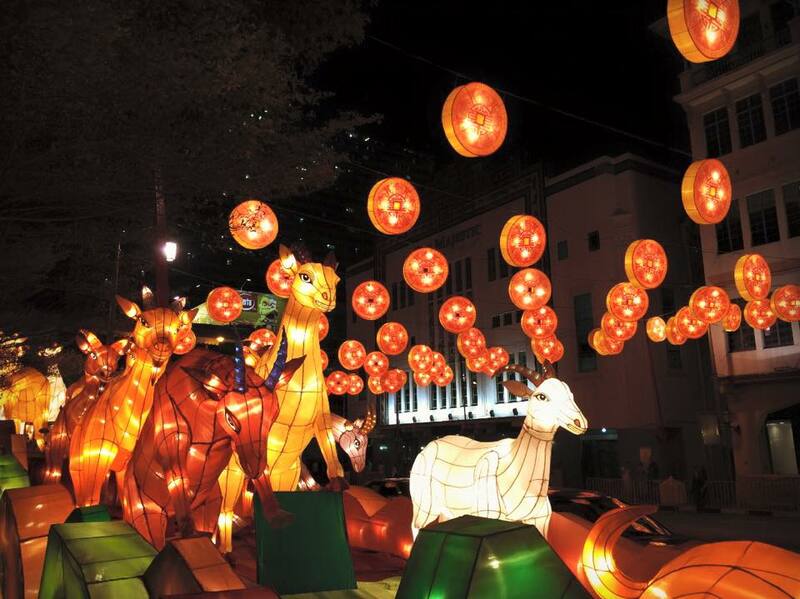 One of the most iconic events to take place along the waterfront, River Hongbao returns for the 29th year with lantern displays, handicrafts, and performances by local and international artists. To commemorate Singapore’s 50th anniversary, the edition features an exhibition entitled Reliving the Past, Welcoming the New Year, which showcases more than 230 photographs documenting the way Singaporeans have been celebrating Chinese NEw Year through the decades. And if you get hungry, feel free to stuff your face with a variety of local delicacies like chicken rice, bak kut teh, prawn noodles, ice kacang and more. Barely has the fake snow melted from the Christmas display at the Flower Dome in Gardens by the Bay and the glassy conservatory is already back with a new look. Entitled ‘Asian Tales’, the latest floral display to grace the flowerbeds aims to bring the scenic landscapes of traditional Chinese paintings to life with fields of colourful dahlias. Visitors are invited to spot goats carved into the flora, and embark on a themed journey through the garden with the help of a trail map that comes with your ticket. Look out for the gardens’ God of Fortune mascot and the craft booths, which are set up on weekends. Enjoy a range of activities, from the Festival Street Bazaar to a walking trail that takes participants on a journey through Chinatown’s history. There’s a mass reunion dinner for the underprivileged on February 15 at the Kreta Ayer Community Club and Singapore National Wushu Federation ($10), and nightly shows of music and dance at Kreta Ayer Square until February 18. All these festivities culminate in a countdown party at New Bridge Road and Eu Tong Sen Street, where local celebs ring in the Lunar New Year with games and fireworks.